The development of robust models for wine grape yield prediction is of clear and growing relevance to viticulture and the winemaking sector. A precise, timely and dynamic forecast of annual yield enables vineyards to optimise planning and management of all seasonal activities, including vineyard intervention dates, irrigation, nutrient management, and post-harvest procedures. Furthermore, yield is principally determined by atmospheric factors, in which context the provision of relevant and accessible predictions can improve the capacity of agriculture to manage the risks, and exploit the opportunities, that will result from future climate change. Conventional crop forecasting systems have been either statistical (regression based) or dynamical (computer simulation based) in their formulation. The former are typically limited by an inability to capture the complex interactions between variables relevant to yield, and the latter by their computational complex- ity and the need for lengthy calibration. 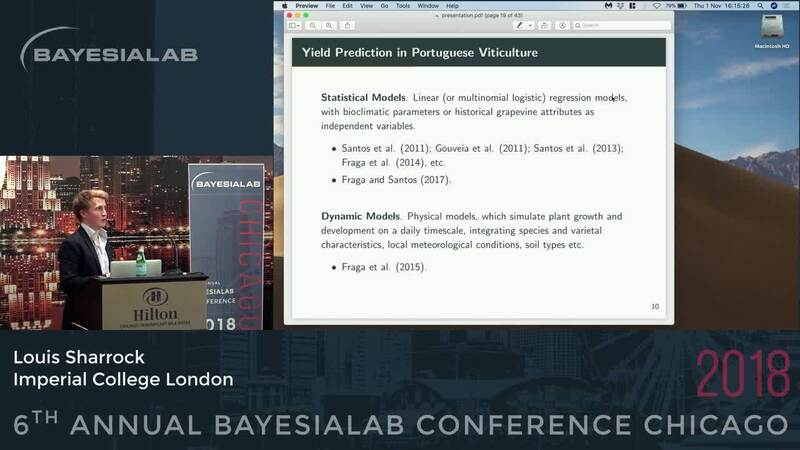 In this thesis, we propose a novel Bayesian network approach to yield prediction in the Douro Demarcated Region of Portugal, which integrates our prior knowledge of the yield formation process with several data-driven statistical learning procedures. While the need for further model refinement is evident, initial results indicate that our model has a relatively high predictive skill, and is largely successful in replicating well established physiological relationships between particular climatic variables and wine grape yield. Sensitivity analyses identify a set of variables known to be particularly significant for yield in this region, whilst also providing tentative evidence in support of previously hypothesised relationships between global warming and the advancement of grapevine phenology. Louis Sharrock is a PhD student at Imperial College London, aligned with the Centre for Doctoral Training in the Mathematics of Planet Earth. His current work focuses on large scale inference in state space models, with applications to environmental monitoring. He previously completed a BA in Mathematics at the University of Cambridge, and a MSc in Statistics at Imperial College, with a thesis based on a novel application of Bayesian Networks in viticulture.